The Really Kid Friendly Blog: London Wetland Centre recruits their 200,000th member! Congratulations are in order for the WWT London Wetland Centre, who have just recruited the WWT's 200,000th member! Company director Rachel Andrew recalls many happy childhood visits to one of WWT's other centres in Washington, Tyne and Wear. She chose to join the Trust after enjoying a day out at London Wetland Centre earlier this year, and in doing so became the charity's 200,000th member. Rachel said, "We became members of the WWT in order to support the work that they do and to be able to enjoy the centre throughout the year, as it is a fantastic location for wildlife photography. We really enjoyed our day at the centre where we discovered how much work goes on behind the scenes to make the London Wetland Centre such a special place for birds, animals and plants - and for the visitors like us who come to enjoy seeing them." London Wetland Centre thanked Rachel with a special early visit to the reserve on Monday 23 August before it opened to the public. This was followed by a personal tour of the beautiful Wildside area of the site with Adam Salmon, the Centre's reserve manager, where the family were lucky enough to spot green sandpipers and hear Cetti's warblers singing. 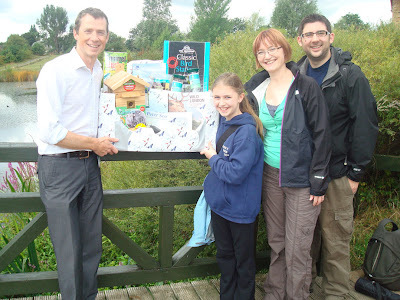 General manager Martin Senior presented Rachel and her family with a special hamper of WWT goodies. The Wetland centre is a very popular Richmond wildlife reserve and visitor attraction, and has a well deserved 5* rating for family friendliness on our website (click here to read Anne's 5* review). The Centre offers families the chance to explore beautiful wetlands and see wildfowl and other creatures close up, and 60,000 children enjoy educational visits every year. A series of reedbeds, lakes, marshes and pools are home to a stunning variety of water birds, and fascinating animals such as dragonflies, frogs, lizards, newts and water voles. There is also an excellent childrens playground, an Interactive Discovery Centre for children (handy for when it rains! ), free family activities every weekend, and regular postnatal buggy fitness classes. Have you been to the Wetland Centre with your family? We'd love to hear your thoughts - click here to review it now, or leave a comment below.